A grateful thank-you to all my recent correspondents, although I’m not entirely sure how to take the remark that “viewing all those electronically unkempt bindings must have been unbearable for a person of sensitive disposition” (see last post). I’ll let that pass while I think about it – but I will continue the saga. Looking for my Victorian novel: having desired but ruled out as being beyond budget a couple of sparkling copies in original cloth, properly described and quite properly priced in thousands rather than hundreds – I ploughed through all the descriptions again. What ideally I wanted was a copy that had been bought and enjoyed in the original monthly parts and then taken along to a local binder to be given an appropriate and permanent binding. A copy like that, to my mind at least, is just as “authentic” – just as “original” – just as “desirable” – as a copy of the book edition in the publisher’s cloth. This is what was supposed to happen to these serially published novels. A copy like that also has the potential to bring us much closer to the original reader and his or her exercise of personal taste in the style and expense of the binding. And, as a welcome bonus, a copy like that is also liable to be quite reasonably priced. I knew full well that almost certainly some of these inept and opaque descriptions must be disguising or rendering invisible the book that I wanted to buy. After a second and third read-through, I’d almost settled on one particular copy as the most likely, but there was another description that I kept coming back to. I could make neither head nor tail of it. Was it a later Canadian edition with steel-engravings (which might have been interesting) or was it the original London edition with the regular wood-engravings? I think it was the “green stippled leather” that drew me back to this copy over and again – I didn’t know what it meant, but I perhaps almost subconsciously thought it sounded more mid nineteenth-century than another colour might have done. I also eventually realised that the vendor appeared to have a shop not all that far away. It would be quicker to go and look at the book than to try and make sense of the cataloguing. It was a long-established shop that somewhat unaccountably I couldn’t remember having visited before – not sure why. And my Victorian novel was the very first thing I saw when I walked in. Bingo! Perfect for my purposes – a copy bound from the monthly parts – the giveaway stab-marks from the simple figure-of-eight stitching that kept the wrappered instalments held together evident throughout. You could even make out faint residual creases here and there from where the original owner had folded a couple of the monthly instalments in half to stuff in a pocket and read on the omnibus. None of this mentioned in the catalogue description of course – nor the fact that the half-titles had been jettisoned by the binder – not something I mind at all on a book of this type, that’s what Victorian binders did – but it’s plainly wrong and impolite not to mention it. As to the “stippled leather” binding – clearly contemporary now I see it – and I have some sympathy for this effort at describing it. I’m no expert on bookbinding materials myself. It pains me every year at London Rare Books School that while I’m blathering away about the first editions market, in many ways I’d rather be next door listening to the extraordinary Nicholas Pickwoad truly explaining these recondite bookbinding matters. But I do have a theory to advance. The book turned out to be bound in that hard, pebbly, slightly shiny leather you sometimes see on books of this period. It’s generally just described as the generic “morocco”, although I can’t be alone in having long suspected that it isn’t. I’m reasonably confident (although happy to be corrected) that it is in fact sealskin – this despite the fact that the phrase “contemporary half seal” (and its more obvious variants) would appear to be entirely unknown to the online book world and even to the very farthest reaches of Google. There are currently only two examples of sealskin bindings in the British Library Database of Bookbindings – one a handsome Cobden Sanderson of 1914, the other a stunning Lilian Simpson art-nouveau effort from 1896, this largely covered by silver plaques and with a warning note that other authorities have described it as goatskin. 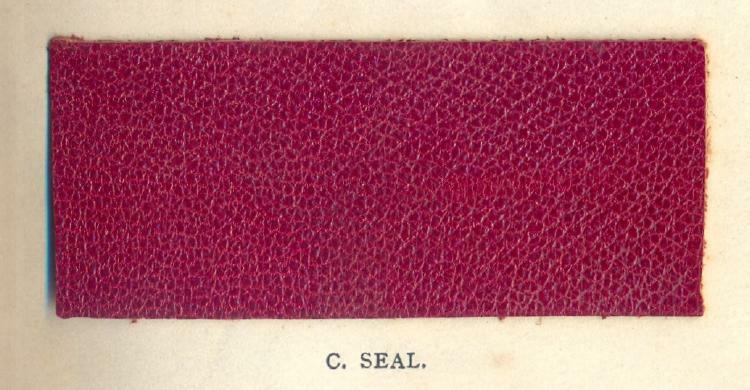 But that sealskin was actually in considerably wider commercial use is attested by there being a sample of it (alongside pigskin, oasis and a host of other binding materials) in Henry T. Coutts and George A. Stephen’s “Manual of Library Bookbinding” (1911) – a real sample that you can touch, stroke and smell (try doing that on your Kindle). Here’s what they say: “Sealskin has strong tough fibres which make it a strong leather, capable of resisting hard rubbing wear; its toughness is at least equal to the best goat, while its suppleness is superior to that excellent leather, inasmuch as it contains a good quantity of natural oil. It is very agreeable to the touch, and the grain has a unique lustre which enhances the appearance … Sealskin is very economical in use, as practically the whole skin possesses the same texture, there being no drawbacks of soft flanky or belly parts as in goat. There is some difficulty in obtaining a good supply of undamaged skins, but the price of seal is below that of the best grades of morocco …”. No reason at all why an alert binder might not have used it on occasion as a viable and perhaps slightly cheaper alternative to morocco. A binding material that “we see and yet don’t see”, as Tim Bryars remarked when I showed him the book. 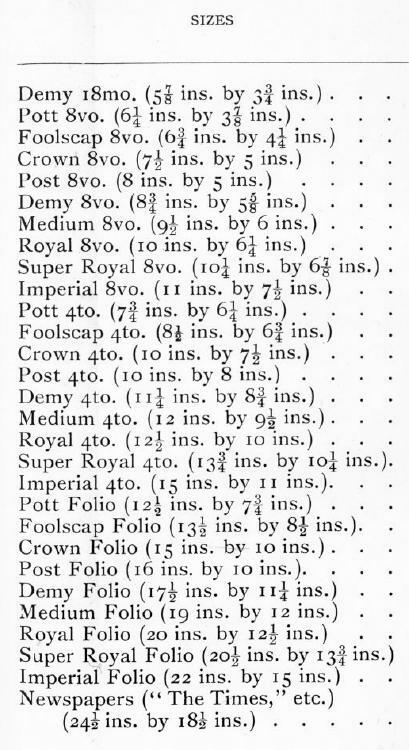 A scan of the Coutts and Stephen sample is appended (click to enlarge) – and for good measure there is another scan of their useful little table of conventional (British) book sizes used for pricing binding work. This is dedicated to those online “booksellers” who think that the long-winded and nonsensical formula “8vo – over 7¾” – 9¾” tall” tells us anything meaningful or useful at all. By now I am very happy with my purchase (and I’ve also found another Victorian novel – one which I don’t think I’ve ever seen before), but there was an extra bonus. Something else not mentioned in the description was the name of the person who owned the book and had it bound. (Why do booksellers omit this kind of detail? – even if the name means nothing to them it may mean a great deal to someone else). 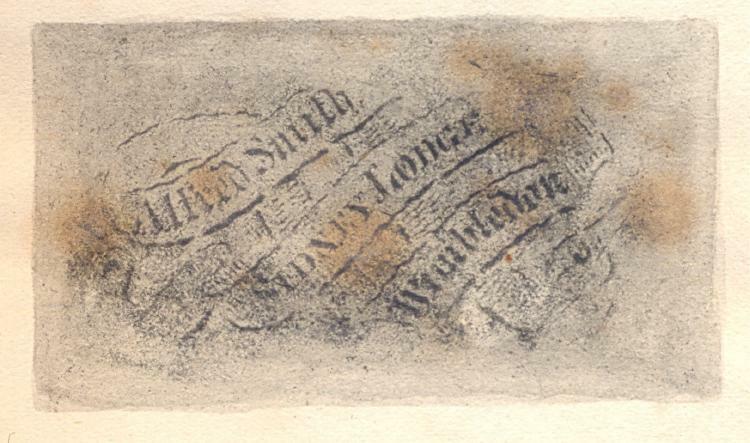 On a binder’s blank in the front was something that at first glance looked like a smudgy brass-rubbing of the name and address of the owner – Alfred Smith of Sidney Lodge, Wimbledon. On closer inspection it turned out to have been printed lithographically direct on to the leaf – a form of ownership mark I can’t recall ever having seen before. A regular ex-libris label or stamp would have been so much easier and almost certainly more legible – but no doubt Mr Smith (b.1835) had his reasons. A bit of digging showed him to be the son of the legal writer John Sidney Smith (1804-1871) – the two of them collaborated in producing the seventh edition of “The Practice of the Court of Chancery”, which came out the same year as the novel. Given the legal complexities on which the plot of the novel rests, the fact that a young lawyer enjoyed it enough to read it from his pocket and later have it got up in rather a fancy binding was as pleasing as everything else about it. Soon passed on to my disappointed customer at a modest profit – and on that happier note I shall end the story. But please don’t think I didn’t notice on my tour of the online book world that some of my own descriptions are being stolen, cribbed and plagiarised without acknowledgement by booksellers who really ought to know better. Imitation, sincerest, flattery, all of that – yes, yes, I know – but (a) if you are going to do it, then at least copy it accurately, and (b) don’t let me catch you doing it again – because I shall name and shame. This entry was posted in Book Collecting, Bookbinders, Bookplates, Booksellers and tagged British Library, Online Booksellers, Plagiarism, Sealskin Bindings, Victorian literature. Bookmark the permalink. Thanks once more, JW. You would need to ask a real expert for a failsafe way. Some of the imitation leathers that Coutts & Stephen give samples of are scarily good. And – first things first – I’m still looking for a failsafe way of telling which books will sell and which won’t. For anyone that needs it, there’s an amplified table of traditional British book sizes on the ABA website at http://www.aba.org.uk/book-collecting/525-traditional-british-book-sizes.